Choice, Creativity, and Assessment: When Does it Work? 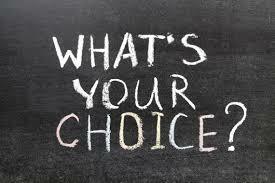 When is a choice not really a choice? Or when might choice make really bad assessment? In my last post I discussed the role of assessment in developing curriculum for creativity. I included the recommendation that assessments—even major assessments–sometimes include choice. We know choice is supportive of a climate of intrinsic motivation and creativity. But in assessment? Yes. Choice in assessment is valuable not just because it is supportive of creativity, but also because it may give us a better view of what students really understand. Choice in assessment often entails giving students a choice of products. Will they write a paper? Create an online display? Present orally? Build a model? Like many things in education (and life), choice in assessment brings both strengths and challenges. The strengths of choice are clear: students are more likely to find a mode of expression that will allow them to show what they know, and they are likely to be more motivated to create a product they’ve chosen—thus giving us a better view of their real understanding. However, choice in assessment also has one major challenge: If students are to be given choices, it must be possible to demonstrate key understandings equally well across options. Otherwise, you’ll learn much more about some students’ understanding than others. For example, if students are focusing on the effectiveness of propaganda in the American Revolution, they could reasonably demonstrate their learning through writing a traditional paper, writing an imaginary debate between on of the Sons of Liberty and a British Loyalist, or creating an online bulletin board display including relevant text. However, making a replica of a Revolutionary pamphlet or costume would not offer the same opportunities to display complex understanding of content, unless accompanied by additional information. Looking at a replica pamphlet, I have no way of knowing how much the student understands about the document’s impact or importance. However, if the pamphlet is part of a “museum display” of simulated artifacts and explanatory display information, the problem can be solved. One key to making sure all available options are feasible is to score them all with the same content rubric. After all, the content is the thing you are trying to assess. If you also want to address attributes of the product chosen (for example, whether actors in the skit were loud enough to be heard or the statue well constructed), keep that as a separate “product” assessment. For example, Coil (2004) suggests using product criteria cards, listing key criteria for each possible product. A “skit” card would list the characteristics of a good skit. Using the cards allows the teacher to create a rubric that assesses content outcomes, with a single criterion that requires that the product meet the standards on the appropriate product criteria card. Before giving students a choice of assessment options, envision how each option would look if it fully met the content criteria. If all the choices give students similar options for success, you are ready to move forward. I know it is not always feasible or wise for students to always be able to choose the means by which they will be assessed. It is important for all of us to flex into less preferred styles. But sometimes, wisely planned choice in assessments can provide both options that best represent students’ actual understanding, and motivation that will enhance their efforts—not to mention their creativity. I think it’s worth giving it a try–and I’d love to hear what happens.